Now that Grand Prince and Pretty Noona has ended, we are trying out live recapping Mistress. Today will be the first time we live recap Mistress in our aftercap format (where we start recapping a show after it has already started airing for the day). Hopefully it goes well! Countdown: AIRING!…check twitter for updates. What are you doing here? You are the guy, you killed JH. The dead JH told me! You are the one that had the affair! ES drives quickly through the street and tells the son that her friend….her friend is in danger! MG looks at JW as she works. She looks very stressed and he looks like he is concerned. the four friends are all at the hospital to support SY and her child. They give her words of encouragement and tells her to let them know what happens. HY and JW leave. ES stays with her. they start to talk about DS being the affair person. If he is the affair person then he killed everyone. That means that JW is in danger. I will double check DS, you just think about your daughter for now. ES leaves. SH comes out of the polcie station. he is met by his thug friend who drives him off. The thug says DS is the affair guy, how did they find YD’s fingerprint? It was at the scene. SH says they always deal with nonsense, that is how they survive. The thug asks if the daughter is okay. He says she is sitll in the hospital. They decide to drop him off at home. Cut to the hospital, it looks like Ye-rin might have coded! They are trying to jump start her heart. SY is looking from the door as they charge Yerin over and over again. They get her heart beating again and then check her eyes. SY is a mess as she watches all of this unfold from the door window. Afterward, the doctor tells SY that they need to check her over some more. SY says she was super healthy. It looks like this is spontaneous lukemia or urgent lukemia that happens spontaneously. The doctor says that this thing happens spontaneously, they will do more tests and see what happens later. They cut to JS leaving with her daughter. It looks suspicious. SH meets JS outside and tells her that they met before. I am going to Ye-rin’s hospital, let’s go together. But the woman just walks away and takes a taxi. SY tells YD about Yerin. SY doesn’t know what kind of mother she is, how can she push Yerin to go to the Kindergarten? YD wants to know what he can do. She says she has something for him to do. Don’t do anything, just live like a dead person just like you did two years ago. The surgery will take a lot of money. We will have your insurance money, to save her, we can live like that forever. I will live with yerin to save her, and you can live like a dead person. He says he understands…..he understands…..
SY apologizes and he apologizes as well. Then SH’s car screeches into the parking garage. They both hide out of site in the car. SH starts walking to the car which makes SY immediately drive off. SH doesnt’ see anything. JS gets to the hospital. A woman accidentally spills her coffee on JS and apologizes profusely. But JS asks for the coffee and then pours the rest of it on her bag. After it is all empty, she smiles and tells the woman it is all okay now. Then she gives her coffee cup back to her. Flashback to JS seeing YD in the car with SY. JS gets to the room and says she was late because of the coffee someone spilled on her bag? Something like that. Then she asks about Yerin. SH is at the room as well and sighs as he sees JS with SY. Cut to SY talking to his insurance boss. He thinks YD is still alive and wants to investigate more. The boss says he trusts him becuse he is a former cop, but he wants this case over, you have 15 days. JW and DS look at all the cute baby things they should purpose. they are looking at mobiles right now. DS says that mobiles are so important because that is what their child will be looking at. DS is happy as he looks around. But JW is aprehensive. She thinks back to DS having seen the USB and not bringing it up to her. Later, they both eat and talk about the Raising Kids variety show. it is an amazing variety show that PD Kim wants them for. JW tells him that he is a chef and not an entertainer. DS says this is a good opportunity for them. JW isn’t interested in putting their kid on TV and using their child because he is not good enough? But then she catches her tongue. She asks if this is the reason he wanted to have a baby so much? if you want to be seen by others then you should do it like an animal in a cage. She storms out. JW cries in her car at work and MG sees her. He gets in the car and says that he doesnt believe he sent her husband the USB. He wants success so much, how can he like someone knowing that he isn’t his kid. You did this to me. MG says that is right, he didn’t send it to her husband, he played it on her TV. JW starts crying and asks him if what he says is true? he says, if he knew that she could be broken this easy then he wouldnt’ have played with her like this. he asks her how long she is going to cry? But then we cut right to the husband who is watching the two in the car. He looks so psycho in that moment. ES meets the son at the fathers house possible? ES searches around for something, she is wearing gloves. It looks like they might be at the dead woman’s house? ES looks through a bag and finds the candle. It was in a little bag that is inside a little box. He says they know who killed his father now. It was YJ. Afterward, the son leaves, but ES asks him if he has time today. Cut to the two of them eating at DS’s cafe. DS tells ES that seh hasn’t been there in a long time. They playfully talk about that. ES gets up and says he is going to the restroom, but he accidentally drops something. ES tells DS that the son is careless sometimes, these are very important tapes. DS is curious, tapes? ES tells him that these are the tapes from JH. These tapes are important because they relate to a murder case. Do you know YJ? The hairshop owner near SY’s cafe? DS thinks for a moment and says that he knows her. So this is the evidence for the murder? ES says yes, that is why it is so important. DS tells her to keep it safe. ES gets a call and leaves the tapes on the table. She walks off. then the son and ES spy on DS. DS looks at the bag, he moves it a little and cleans the table. The son thinks he might not be the murderer, they just wasted money on those tapes. ES thinks SH lied? Cut to SH. The thug asks SH for a file so SH tells him to search his desk. SH leaves to the elevator and thinks about the finger printing he did at YJ’s house. he runs back up to his office just as the thug find a wallet in his drawer. SH grabs the wallet quicly and gives the thug the file. The wallet was YD’s wallet but the thug didn’t see it. Flashback of SH making YD’s finger prints and putting them everywhere in the house. ES thanks the son for all his help today. She gives him a gift of shoes. He gives her a hug. ES is shocked by the hug but the son keeps hugging her and tells her, thank you for removing the suspicion from my mother. he walks off. ES looks at him walking away and tells him that she will see him soon. SY tells JS thank you. JS tells her that she should share her insuance money with her. How long has she seen YD scretly? Have you seen him from the begining? I son’t care, I just need the money. You know how expensive it is to raise kids. SY asks her how much she needs. She basically says she wants everything accept the surgery fee. SY is shocked about that. JS looks upset and says she saw SH and he asked her about YD. I will wait for you in your house, it is an empty house anyway. KS leaves. SY calls someone on voicemail and says this is urgent, call me as soon as you hear me. ES tells Sh that DS is the affair man. He wants to know if she is sure. ES says the tapes are hers, so give them to her. SH deny’s that he has it. He says that DS is JH’s affair person ~. I thought it would be a different person, that is shocking, maybe I wanted to believe it. ES meets with HY. HY thinks she should quit her job, she didn’t go to law school to follow people around. She is frustrated about it. Then she asks ES why she is there. ES tells her that she wanted HY to follow someone. YD shows up at the hospital. SY asks why he is there! he says he came right away when he heard her voice. SY tells YD that JS knows that he is alive. She wants all the money except the hospital fee. YD thinks no one knows that he is alive. But then he thinks they should give her all the money. She is not a bad person, I guarantee it to you. SJ asks if he knows how she feels? She hates him more than her. he is the one that screwed up everything. You can’t show up like this, what if someone sees you? i am going to save Yerin, I need Yerin, so you just live like a dead person. you are a dead person to us anyway. He says he wants to see Yerin. SY tells him not to show up again or she will kill him. YD understands and gives SY Yerin’s clothes. SY starts crying. But then we cut to JS looking over the banister at them in a psycho way and the music is also really psycho as we watch her watching them. SH meets with JW and tells her that he has a question about her husband. JW is stunned, my husband? HY is following SH around so she calls ES and tells her that SH went to JW’s house. ES is alarmed and says she is going there right now. HY keeps following SH while ES comes to her house. ES talks to JW about SH and fills her in a little bit. She says that Sh is suspicous so HY is following him, why did he come there? JW says he asked about her husband. ES asks if that is it. JW says that is it, did something else happen? ES leaves and calls SH, she thinks SH knows he is following her around. HY tells her that SH is at Yerin’s hospital right now. Meanwhile, JW is pacing her house as she holds SH’s business card. JW – My husband that nigt? SH – were you together? JW – yes, we went to sleep together, he was next to me until morning. SH plays the recording to SY. SY asks him if he really thinks YD is dead. Does he really want to take the insurance money back? He says he is worried about her. But SY just wonders why everyone is worred about her. She tells him to leave becaue it is Yerin’s bath time. Yerin asks SY if she faught with SH ajusshi. SY says it isn’t like that. She asks when she is going home, SY says as soon as she is cured. Yerin says she wants cherry (her doll). SY tells her that she will get it for her. Elsewhere, ES sits in the car and listens to SH’s recording from when he talked to SY and SY secrety called ES. JS has taken over this house. her child has taken over Yerin’s bed and JS is laughing uncontrollably on the couch as if this is her house. SY just grabs the doll. But she also says something nice to Sung-hee and gives her one of Yerins dolls. She says Yerin would be happy for her to have it. SY walks to her room and JS talks to her there. She says she was so noisy on the stairs. SY asks if she saw how it ended (with a hug). JS tells her that he is just like that. He is weak for women. JS says her husband is just like that. If Sung-hee’s eunnie lived, she would be 12, but she was sick. SY asks her what she is talking about. JS pulls out another picture from 2005 where JS and YD are holding another child while she is also pregnant. JS says she is the real wife and SY is the mistress. You took my husband! I broke into your place? What about me? You took my husband. SY gets a call right at that time. It is about Yerin. SY is scared and runs off quickly. SY runs to her car. JS is left in the apartment, she looks crazy as seh bites her fingers. ES is in her car as well. She calls SY. But SY is driving in a state of fear. She answers the phone, it is YD. She tells him that he lied to her from the begining, you need to tell your first wife first. She hangs up and then sees ES’s call. JS is very nervous at home for some reason. the phone starts ringing. She answers it and then runs out. SH follows her and HY follows him. It is a follow-athon. SY runs to the hospital, Yerin is stable. He tells her that she did a good job today, you can tell that to her. Yerin is sleeping right now and SY cries over her bed. ES gets to the room at that time and runs to SY’s side. JW wants to talk to DS about YJ. She brings up the hairshop owner near SY’s cafe. He stops. But then he tells her that this is the first time and he goes into their room. Later on, they are both sleeping in bed. JW sneaks out of bed and gets in her husbands car. She checks the CCTV in the car. The CCTV shows footage of the car driving. JW says, yes, he came back right away that night, what am I thinking? But then she remembers him tucking his clothes in. She opens her computer again and looks at the CCTV some more. It shows DS meeting with MG and beating him up. Elsewhere, HY keeps following Sh around. ES talks to SY about when she talked to SH. She wants to know if it ws true that SH put the finger prints there. SY says she doenst’ care who killed who, that is none of her business. For me, my Yerin, if she is alive then that is it. ES says she understands, but she has to tell her, this is very improtant. YJ, your husbands fingerprints where found at YJ’s murder scene. Cut to SH walking through and alley and putting gloves on. It looks like JS is wating for him? ES – What if SH makes DS, JH’s affair guy and he makes YD, JY’s murderer. He is a dangerous guy. You suspected DS, but maybe it isn’t him because he didn’t respond to any of the recordings. SY thinks HY is in danger. She tries to call her. Cut to HY walking the same alley as SH and JS. SY says her power is off, where is she now? When was the last time you talked to her? We need to find her. If SH lied to us about everything then we don’t know what he will do. SH is holding HY’s head. She is passed out. SJ calls someone and says she is in front of the place, she came alone, yes, she will wait there. Cut to the murder of YJ. Someone strangels YJ and the same person stangles JS!!!! It is YD! He hasn’t killed JS though, he tells her that she was just supposed to follow her around. She is the most precious thing to her because she is the most expensive thing she owns. You are my person because you are the only person I can trust. I made everything. I did everything. When she gives you money, I will turn everything back! SJ says that Yerin had a seizure, what if something happens to her? YD walks back up to JS and holds her face. He tells her that people don’t die that easily. You were almost dead a few seconds ago, you are almost alive. Don’t worry about it, just do what I tell you and the insurance money is ours. YD takes off running! SH gives chase. ES is driving frantically, she gets a call from ES, he wants to know where she is. She says, My friend is in danger! HY is starting to wake up from being out. She has her phone in her hands. HY walks through the alley, she is stunned. SH goes to JS and asks her where YD is. But then YD comes from behind him and hits him hard in the head with a crowbar. JW meets with MG. MG is so busted up. He tells her not to trust her husband. He is a scary guy, leave him. He knows it isn’t his own kid but is happy like that. I am telling this for you. I didn’t play the blackbox video. ES manages to find ES and checks if she is okay. She apologizes for having HY follow SH and says he is a dangerous person. The four woman have a body in the back of the car. they say they shuold take him out quickly. Another car drives up. The women freeze. they stare at the car. JS gets out of the car and walks up to them. She stares at them then pulls out her phone and calls the police. JS – Hello, someone is murdered here. She is important for me. So glad you are sticking with this show even though there aren’t subs! THANK YOUUU! i’ve been dying to know what they said as i only know basic korean. watching the drama raw is kinda torturing. lol. Yes, it is really confusing. I will try to sum it up and it will probably benefit everyone who reads this to refer to the character chart that is linked at the top of the page. The entire show seem to be about finding out who Jae-hee’s affair partner is, who killed MJ and JH, and whose dead body is that in the warehouse. 1. SY’s husband, Young-dae, was presumed dead so she collected 2 million dollars. 3. JS has a daughter as well who becomes fast friends with SY’s daughter. 4. It turns out that JS’s daughter is actually from Se-yeon’s husband. 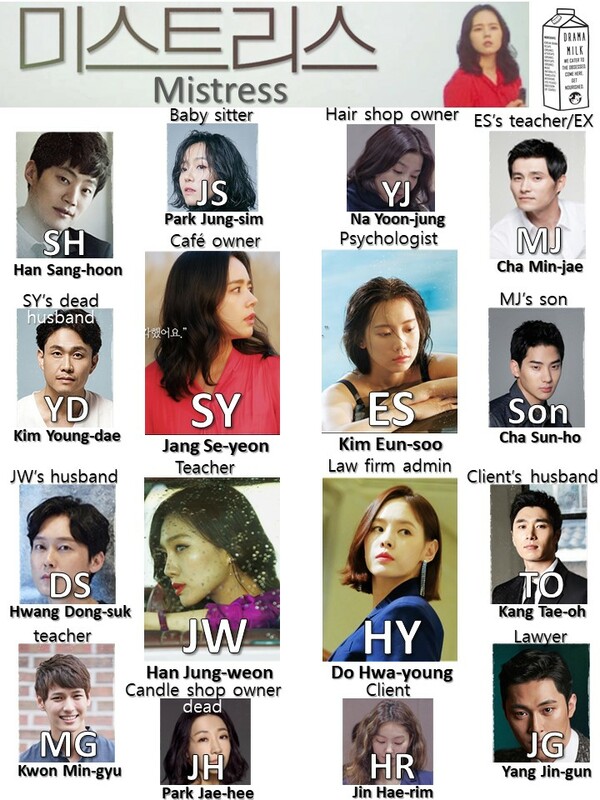 So Se-yeon’s daughter and Jung-sim’s daughter are half siblings. SY fired JS when she found out and hires a new nanny. 5. But then she rehires her when Yerin wanders off one day and JS finds her. The situation is suspicious as to how Yerin wandered off from the new nanny. It seems like JS lured her away in order to “find” her and get back in SY’s good graces. 5. A man named Sang-hoon is sticking around Se-yeon. He works for an insurance agency and is trying to secretly prove that SY’s husband, Young-dae, isn’t dead so that they don’t have to give her the 2 million dollars. But it looks like he might have fallen for SY in the process. 6. SY finds out that Sang-hoon lied about who he is an is actually an insurance fraud investigator. Everyone thinks SH is shady and doesn’t want SY to involve herself with him anymore. 7. But we find out that SY’s husband is actually alive and he is super psycho. he pretends like he is a great person, but in actuality, he might have been married to Jung-sim before he was married to SY and only sees SY as a very prized and rich possession. He and JS worked together to con the insurance agency and SY. It also looks like he killed YJ and might have killed SH as well. As of this episode, we aren’t sure. 1. Eun-soo is a psychologist who fell in love with their married college teacher, Min-jae (MJ). 2. MJ was murdered in cold blood and the killer was never found. 4. The believe the real killer killed MJ with a candle that ES made for him. 5. They found the candle at Yoon-jung’s house (the hairdresser who is next to SY’s coffee shop). Only, YJ was also killed by someone. We don’t know who yet. 6. ES works with Se-yeon to find out who the killer might be. They suspect it is Sang-hoon (SH). 1. Hwa-young has been following a man named TO around because his wife thinks he is cheating on her. 2. However, they find out that the “wife” is not actually TO’s wife, she is the mistress of their friend Jae-hee’s husband who was killed a couple years ago. 3. The husband is in jail for murdering his wife, JH, but he is adamant that he didn’t do it. So he is using his wife HR and his mother YJ to find out who the real killer is. The only problem is that his mother accidentally killed MJ when she was trying to find this information out. 4. Now, HY is following around SH because ES wants her to. 1. Jung-weon had a one night stand with a teacher, Min-gyu (MG), that led to her getting pregnant. 2. Her husband, Dong-suk (DS), really wants a child so they can be in a variety show about the proper food to feed your pregnant wife. The only thing is, he is infertile. 3. However, in the last two episodes we find out that DS is a little bit undercover crazy. He actually knows that his wife cheated on him, but pretends like everything is wonderful because she is pregnant. 4. But a bombshell is dropped recently, DS might also be JH’s real affair partner and he may actually be the person that killed JH. 5. SH goes to JW’s house to question her about what DS was doing the night that YJ died. 6. This makes JW look at their car CCTV where she sees DS beating the ish out of MG. JW meets with MG and MG tells her that her husband is psycho, why is he acting so happy to her when he knows she is pregnant by another mans child? There is one big thing that ties almost all the woman together, which is JH and a candle making party. All but HY went to it. ES’s candle is used to kill MJ. Another broken candle piece is seen at DS’s restaurant. Thank You so much. 💖This tied everything together. Almost everyone apart from the ladies is a psycho ! They have so many psychos around them! And to think it all stemmed from that candle making party! Exactly! 😂 But Mistress never steers into makjang territory- thankfully. The ambience is very carefully crafted and I appreciate how they’re giving us the details one by one whilst crafting it into a coherent story. I guess I’m still salty about how Misty left so many loose ends but Mistress has already surpassed my expectations. Misty shall not be named! I am still bitter about the ending 😡. Really happy with Mistress and Children of a Lesser God. I am enjoying OCN suspense! We plan on recapping Life on Mars once as well. I’ve yet to catch up on Children of a Lesser God. So far I know OCN has killer suspense content – quality at its finest. Their romances however, (Eg. Secret Romance, Melancholic) are bland and boring at least unfortunately. Life On Mars is super interesting- I love the vibe of their teasers but I know subs will also once again be nonexistent. So I’ll either start it late or go in raw if you continue to do recaps. Basically this blog is my life-vest when I go in raw. I’ll end up watching each ep twice. One raw+recaps and then with subs. Hahaha.. I agree.. this drama so complicated..and also make curious about the ending.. a.k.a. the whole story.. I am trying to find that one! The one that goes “It could be you…it could be you…” . We checked the OST, but it looks like they only have one released so far. Also used a song finding app, but it didn’t match anything. It sounds kind of like Lykke Li, but I would be amazed if they were able to pull her for their OST. I think it might be a Korean artist with a melo sound. Hopefully it gets released! Loved it when it played and I ended up watching even the credits which I usually skip.